Internet services will be offline during the upgrade, a process that we expect to last between 15 and 60 minutes. This outage will begin at 5:00 PM on September 27th; our hope is to have service restored by 5:15 PM, though 6:00 PM would be the latest that we’ll see the outage last. Last year, the district had 1Gb of bandwidth, and routinely used about 850Mb while maxing out (fully utilizing) our bandwidth several times per day. This year, with more devices in our elementary buildings and a high school 1:1 initiative, we’re maxing out our bandwidth every day at the start of the day, as you can see in the chart at right. 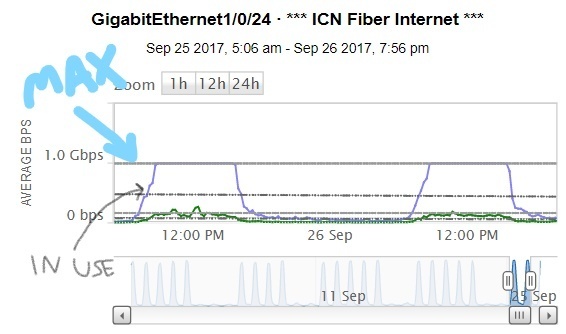 Our internet utilization immediately shoots to 100%, and stays there until the end of the school day. With an increase to 3Gb of bandwidth, we expect (though it’s very difficult to predict exact expected loads) that we’ll see daily utilization averaging about 2Gb, leaving room when utilization is high. In addition to expanding our bandwidth, we’re also switching firewalls to a managed firewall service provided by the Iowa Communications Network (ICN), our internet service provider (ISP). While we have worked to replicate all of our firewall rules and routes, we expect some hiccups as we transition to the new service. If you encounter sites or services that are incorrectly blocked by the new firewall (or incorrectly allowed), please report issues to the helpdesk by submitting an online support request or calling/emailing the helpdesk. Our networking staff will be closely monitoring the service and requests that come in during the first couple of days following tonight’s upgrade. Since the start of the year, our maxed internet connection has resulted in slow access to web pages and other online resources, and in some pages, services, and videos that have failed to load properly. We expect this upgrade to eliminate those issues. We had planned to complete this upgrade during the summer, rather than during the school year. The managed firewall service we’re using for the 3Gb internet service is a new service provided by the ICN, and we had a couple of false starts where we worked with ICN engineers to get the service running, but instead had to postpone due to technical issues on the ICN side. We believe that the technical issues are now resolved, but regret that this places our upgrade window during the school year when it’s more disruptive.